It had been years since anybody claimed to have seen the legendary Ogopogo — Canada’s version of the Loch Ness monster…until this month. In the past three weeks, there have been three sightings of the giant serpent-like animal said to dwell in the enormous and deep Lake Okanagan in British Columbia. On Sept. 12, David Halbauer, his brother Keith and their families were enjoying a picnic at one of Lake Okanagan’s many beaches when they saw something that left them awestruck. “When you’re sitting by the beach on a sunny day, you don’t expect to see a dinosaur come out of the water,” David Halbauer told Global News. The brothers likened the animal to a “giant snake” moving across the water and said it was about 15 meters (49 feet) long. Since that encounter, there have been two more sightings of Ogopogo, generating plenty of excitement among locals and tourists alike. Indian legend describes a monster that would rise from the depths when storms battered the lake, but the first documented sighting of Ogopogo was in 1972. Multiple witness accounts describe a creature with a long undulating body, several humps and a head resembling a horse. Bill Steciuk, who lives in the nearby city of Kelowna and runs a website dedicated to the legend of Ogopogo, said he’d been left stunned by the cluster of sightings. Mr. Steniuk’s obsession with Ogopogo began in 1978, when he came to a screeching halt while driving over the Lake Okanagan floating bridge after catching a glimpse of something in the waves. The experience prompted Mr. Steniuk to dedicate his life to hunting for Ogopogo and he has organized numerous expeditions on the lake over the years, finding nothing. His luck changed in 2015 when he spotted a large snakelike head popping out of the water about 150 meters (490 feet) from shore. 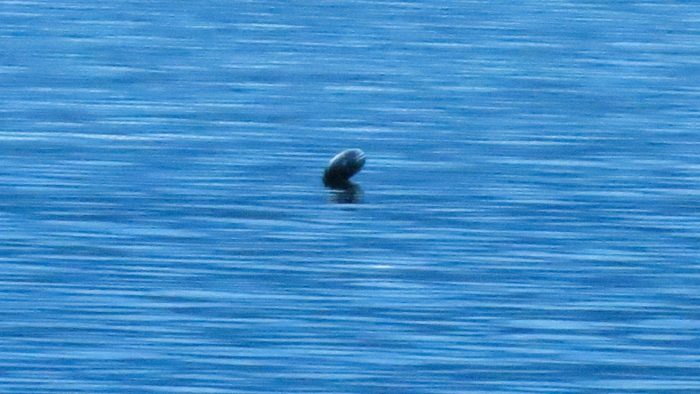 He quickly grabbed his camera and captured an image of an odd, round object breaking through the lake’s glassy surface. He is convinced it is a photo of Ogopogo. Mr. Steciuk believes the lake may be home to dozens of the elusive serpents. “The theory is, that eons ago, this lake was open to the ocean,” he said.